First Street's newest addition School For Scandal has really wormed its way into our lives. We like to judge a restaurant on three things; great food, good selection of drinks and beautiful decor and SFS gets a massive tick for every single one of those. The place itself has that real curb appeal with massive tattoo style illustrations, plush green velvet booths, brass light pendants and plants everywhere - a real Instagram heaven. It's grown up & sophisticated grunge and for us that's 11/10. The cocktail list is pretty sizeable with all the classics covered with their own favourites in between, many with exceptional names take Dame Judy Quench and Oprah Ginfrey for a couple of examples. 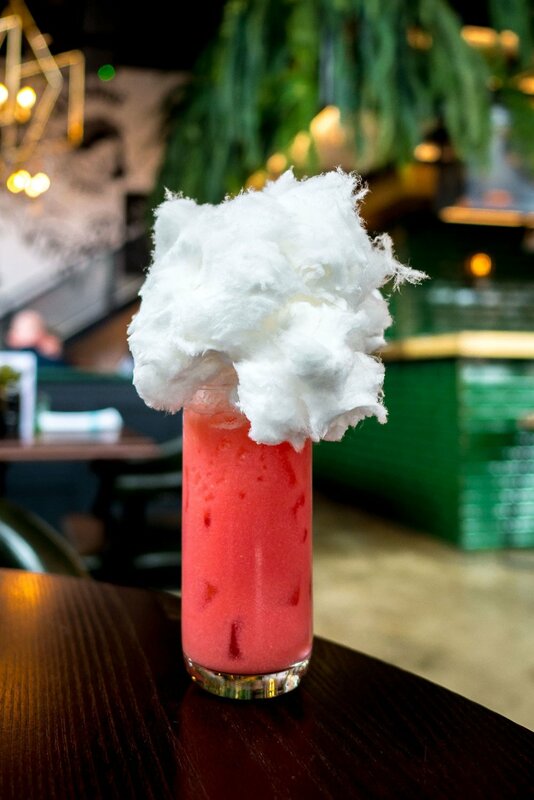 That's said when you spot that one of their classics comes with candy floss it's hard to even consider anything else... although we did manage to try the Risky Business too because you can't turn down the sound of house infused coconut bourbon, pineapple & green tea syrup, coconut water and Fevertree tonic - talk about hitting every millennial stereotype in one glass?! We'll be back again soon to try some more of their cocktails because there's so many that sound incredible so keep an eye out on our Instagram for more! The food menu isn't what we expected to find at all but by no means is that a bad thing. With the tattoos and the pure attitude this place oozes we expected an Almost Famous style feast but instead School For Scandal is all about healthy choices for everyday dining (with a few naughty home comforts thrown in for good measure), and a big focus on protein & plants with quality, care and flavour. To take full advantage of the healthier dishes we sidetracked the burgers & tacos and both opted for fish. 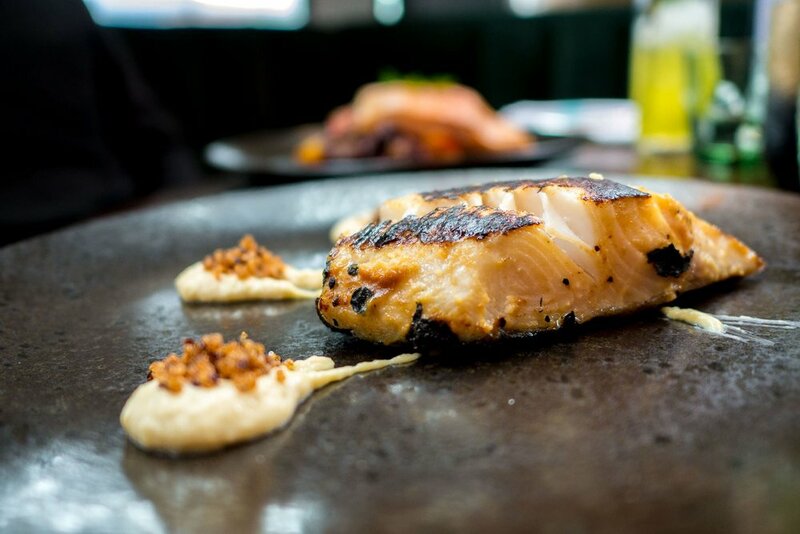 We'd highly recommend the miso marinated black cod, a generous tender portion that flakes away and melts-in-the-mouth. As this dish doesn't come with any sides we ordered something to come with it since we were feeling hungry! We went for the truffle and Parmesan fries that were far from shy on the truffle dosage but if you're looking for something healthier you could order the wilted spinach or tenderstem brocolli. The cosiest spot in Manchesters Spinningfields!